Chelsea and Southampton will do battle in the FA Cup semi-final this weekend at Wembley. The Blues came from behind to win last weekend in the Premier League courtesy of a Olivier Giroud brace and an Eden Hazard goal. READ MORE: Who are Europe’s top 5 goalscorers in the best 5 leagues? Relegation-threatened Southampton fought brilliantly for most of the game after Dusan Tadic and Jan Bednarek put them two up. 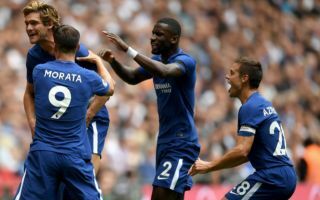 It has been a miserable campaign for Chelsea, and with Antonio Conte’s future looking more likely to be away from Stamford Bridge, an FA Cup would be a wonderful way to bow out. When is Chelsea vs Southampton and what time is kick-off? The FA Cup semi-final action gets underway at Wembley at 3.00pm on Sunday, April 21. The match is live on BT Sport 1/BT Sport 4K UHD and can be stream online. The big news is that Marcos Alonso was charged by the FA, and faces a three-game ban if charged and found guilty of violent conduct for his tackle on Southampton striker Shane Long. Alonso denied the charge, however, this was rejected after an independent commission hearing on Wednesday. Danny Drinkwater (calf), David Luiz (ankle) and Ethan Ampadu (broken ankle) are injured. Mario Lemina (back) is not expected to play, whilst Sofiane Boufal is a slight doubt due to illness.